Samsung's newest 64GB SSD is the largest solid-state drive yet. March 27 is a significant day for Korea's Samsung , as it holds its annual Mobile Solution Forum in Taipei today to announce the hottest imminent new products and technologies. Foremost among those revealed this morning is a larger, faster solid-state drive (SSD) that uses flash memory to replace the spinning platters in conventional hard disks. The new 1.8-inch SSD is the largest yet from a major manufacturer, coming in at the 64GB mark, which brings the technology ever closer in size to typical HDD territory. The drive uses eight gigabit single-level-cell NAND flash memory chips, which allows it to operate considerably faster than Samsung's previous-generation 32GB SSD. Confirming that the 64GB SSD is faster than conventional hard drives, Samsung also noted that its read and write speeds are 20 and 60 per cent faster than the previous model. After production begins in the second quarter of this year the most likely destination for the new drive is, of course, in high-end rugged laptop computers, which will come at a premium price, but there are other options. Samsung says SSDs in the 8 to 16GB range will end up in sat-nav systems and camcorders, while flash drives with hundreds of gigabytes of storage will eventually be used in servers. If anyone is wondering why the sudden upsurge in interest in SSDs, Samsung's footnote shines some light on the reason. 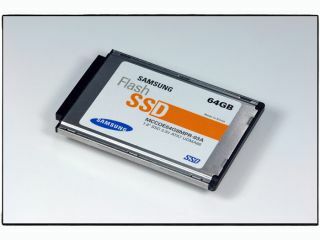 The predicted value of the SSD market this year is an insignificant $200 million (£102 million), but that's set to rise to $6.8 billion (£3.5 billion) by 2010.